When faced with bankruptcy you may think that you are alone, but in fact nothing could be further from the truth. There are many bankrupts. Many who have been millionaires have still faced bankruptcy. Many of them have then gone on to have successful careers and once again reach that magical figure. Some however, have not learned from their experience and have gone into bankruptcy a second and third time. You may wonder how people with such amazing wealth managed to go bankrupt. The message here is that it can happen to anyone, some through their own doing and some through circumstances beyond their control. If the stars can bounce back, so can you. Have a look through the list of international celebrities who have been made bankrupt below and see how many you recognise and see if you can guess who has done it more than once. Henry John Heinz - Condiment manufacturer. This list is by no means exhaustive, there are many, many more famous bankrupts but this give you the idea of how common the problem is even amongst the rich and famous. When you facing bankruptcy remember you are not alone, many others have been here before you and you won't be the last. Talk to someone and get help. By doing so you may be able to avoid being made bankrupt. Being in trouble financially does not automatically mean that you will go bankrupt. Ignoring the problem, especially with secured loans or a mortgage, can mean that it may happen. 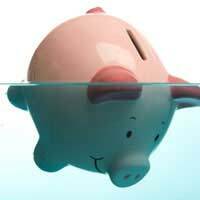 Although being bankrupt does not have the same social stigma that it did when some of the above were made bankrupt, it is difficult to recover from it. Lenders will be wary of you and you will find it very difficult to get any credit without paying very high interest rates for at least six years after discharge. Changes to Bankruptcy Rules: Pay to Declare Bankruptcy? Following the sale of our house our divorce will be settled but there has been accrued marital debt prior to the divorce and unpaid mortgage, electric etc.. I am unemployed due to health problems and no likely hood of employment. My ex is employed and is earning will they be held responsible for all of the debt?